Do Mirrors Reverse Left and Right? The following owes its origins to versions of this entry written by Eric Schmidt, Phil Gibbs, David Richards, and Scott Chase. When we look directly into a flat mirror, it seems to reverse left and right but not up and down. Does it really do that, or are we doing some kind of mental reversal, and incorrectly attributing that to the mirror? Let's be clear: there is only one direction singled out for a flat mirror, being the direction perpendicular to its surface. This direction is the only one that it can "know" anything about, and that direction does get reversed by a mirror: that is, if you point an arrow toward the mirror and precisely perpendicular to it, the image is an arrow pointing in the opposite direction. So mirrors reverse in-out, and that's all they can ever do. Anything else that seems to happen is a result of our psychology. Of course, if we lay the mirror down, then the arrow that points into the mirror now points down, and so its image points up. Now we have gotten the mirror to reverse up and down: just think of the upside-down landscape you can see in the surface of a lake. Likewise, if you stand the mirror up so that you're looking almost into its edge, then the arrow pointing into it will now be horizontal and pointing, say left, while its reflection is pointing to the right. Now we've gotten the mirror to reverse left-right. But in both of these cases the mirror was really just reversing in-out, which is all it can ever do. We, as humans, supplied the additional descriptions of up-down and left-right. Now face directly into the mirror and hold an arrow parallel to the mirror and pointing from your feet to your head. The arrow's image runs alongside the real arrow and points in the same direction in both our world and in the mirror world. So the mirror doesn't reverse up-down. Now hold the arrow in your left hand, pointing it to your right hand. Again its image runs alongside the real arrow, and this image points to our right, just as the real arrow does. The image hasn't reversed direction. So why do we think that mirrors do reverse left-right? The image of the horizontal arrow in the previous paragraph points to our real-world's right, but we see our image in the mirror holding an arrow that apparently is pointing to that "image human's" left. It must be that such an idea is a by-product of how we define left-right. That is, we might see ourselves reversed left-right in a mirror (perhaps some people don't think that way, but most do), so it could be said generally that while a mirror doesn't reverse left-right, we do make a left-right swap mentally when we look into a mirror. But why do we do that? What if we were suspended horizontally above a mirror that's lying flat on the ground? Where is up-down in this case: is it the direction along the line of gravity, or is it a direction defined by the shape of our body, the direction "above" our head? We need to define up-down and left-right. Most people would say that when they look in a mirror, up-down is defined not by gravity (after all, they could be weightless in the Space Shuttle), but instead by their sense of how their body is orientated. If our perceptions are determined by where our head is, what about beings who might be living on other planets, who don't look like us? What do the beings of the ocean planet Skyron see when they look at themselves in a mirror? They spend their lives floating within the waters of their planet. 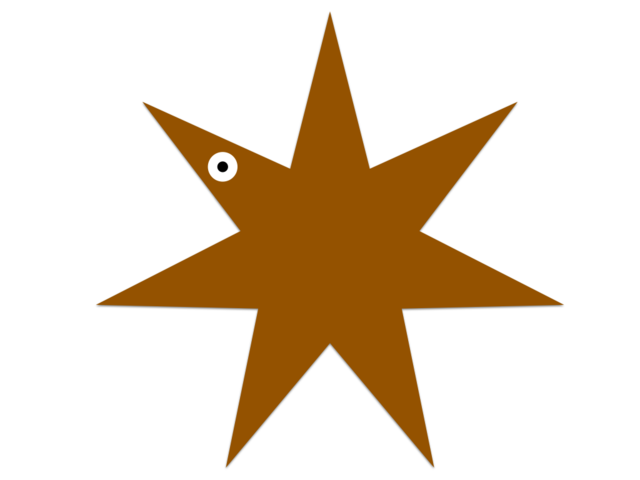 They are star shaped with a single eye on one leg, but otherwise are symmetrical around seven axes. They have no single natural left-right direction, nor any single natural up-down direction. But maybe we can get these creatures to define these directions for themselves. We needn't make any demands on them by asking, say, that they rotate themselves so that their eye is uppermost. But if we can define up-down and left-right for the creature at left, and it looks at itself in a mirror, it might then think that the mirror reverses left-right around each of the seven axes. Surely though, the mirror knows nothing about the number seven. But why should the Skyron creature only see itself left-right reversed around seven axes? Presumably no matter how it's orientated in space, once it defines a sense of up-down and left-right, it will see itself reversed left-right in a mirror. As we said above, mirrors only reverse in-out, so a sense of left-right reversal depends on how we define left-right, and is not a simple physical thing. For example, look at the being from the planet Torsor at the right. 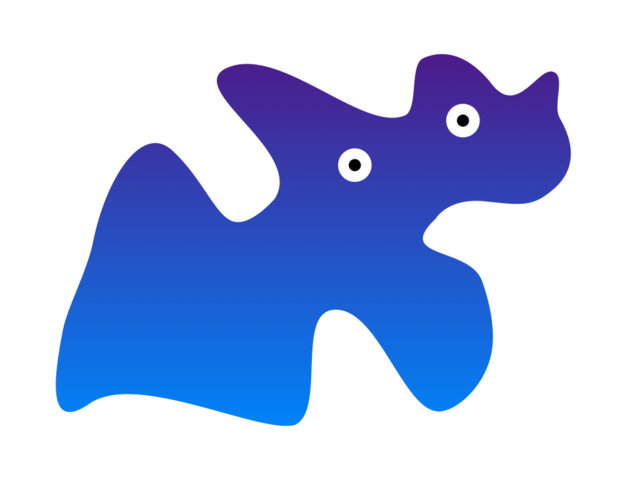 It's a blob with two eyes and has no symmetry at all. But it too will see itself reversed left-right provided we give it a concept of left-right to begin with. If there is any number of axes that a being could consider itself to be reversed about in a mirror, and yet the mirror only truly "knows about" in-out, then it must be that the up-down and left-right directions are constructs that we are imposing on the world we see in the mirror. Our definition of left-right is fundamentally physiological. It starts with the symmetry of our bodies: for example, we all have our heart on the same side, so if we position ourselves so as to be aware of where our body is in relation to the objects around us, then we can define left to be the direction in our chest plane that points from our centre to our heart, perpendicular to up-down. Given that most of us have a preference for which hand to use in everyday tasks, from an early age we relate left-right to our hands. This isn't true for everyone: some people who are e.g. left handed but right footed do have to think carefully, even as adults, about which direction is left-right. Perhaps ambidextrous people have an even harder job of remembering which direction is which. Deciding which direction is left-right is probably always preceded by a choice of up-down and forward-backward. When standing, we typically choose up to be the direction from our feet to our head. If we're curled up in a ball, we might choose up to be the direction from our chin to the top of our head. And we typically set forward to be the direction in which we're facing. We can make other choices of course, and we can easily define such directions for a machine, so the general idea is not really anthropomorphic. Ask two people facing each other to point up: they'll both point in the same direction. Now ask them to point right. They'll point in opposite directions. They have each chosen one additional direction, say front, before they could specify the direction of right. And because those two people have chosen opposite directions for their front, this has also altered their definition of right. It's remarkable that the laws of physics also have a notion of this "handedness", including a particular choice that Nature makes in one field of particle physics. But, of course, as children we don't learn our concept of handedness by studying particle physics. Suppose I have a clear notion of which is my right hand. I notice that if I open my right hand and point my fingers forward, then close the fingers in such a way that they rotate to the "up" direction, then my thumb points right. Notice that if any one of forward or up is reversed, the direction of right will be reversed too. This is an example of applying the "right-hand" rule to sort directions out. The ordered triplet of forward–up–right becomes a "right-handed" set of axes. Mathematicians use this idea to distinguish between sets of axes in three dimensions: the only options for such mutually perpendicular axes are left handed and right handed. No matter how you rotate them in space, these two sets of axes can never properly "become" each other, just as our hands can never become each other. So when I look into a mirror, what do I see? I see an image of myself that is actually reversed forwards-backwards. That's a strange sort of reversal, and one that's not immediately obvious when we see our image. If I have a freckle on my left cheek, what do I see in the mirror? Just as that freckle is on the same side of my body as my heart, so too the man in the mirror has the freckle on the same side of his body as his heart. So he must have the freckle on his left cheek too—and the mirror has not reversed left-right!—if he has been taught that "left" means the side of his body that his heart is on. But now I'm attributing thoughts and an independent existence to the man in the mirror. He's not real, but if I insist on saying "his left cheek", then I must be imagining that he has made a choice of left-right for himself. Suppose I forget about anything to do with where his heart is located, and I don't attribute an independent existence and thoughts to him. Instead, I imagine myself to be him, to be in his shoes. I point my right hand's fingers forward (his forward), close them to point up, and decide that my thumb now points to what defines his right, although of course by choosing to use my right hand, I've already defined his right; turning the fingers as I did was just a way of sorting the various directions out. But the direction that I mentally point to with my thumb is my left. So my procedure of deciding on left-right has gotten reversed by the mirror, because the mirror reversed forwards-backwards (in-out) but not up-down. But notice that I still used my right hand when I was imagining myself to be the man in the mirror. If he could speak, he would tell me that I was applying the right-hand rule wrongly: that I was using the hand that was on the same side of his heart, when I should have been using the hand on the opposite side of his heart. The bottom line is that a choice of left-right is something we humans make that depends on our choice of up-down and forwards-backwards. Mirrors only reverse in-out. They don't reverse left-right; we do, but only when we mentally place ourselves in our image's shoes in the mirror. Thanks to Robert Newton, Eric Schmidt, Phil Gibbs, David Richards and Scott Chase for inspiration and several ideas that were integrated into this text. The Left Hand of the Electron, by Isaac Asimov, contains a very readable discussion of handedness and mirrors in physics. The Ambidextrous Universe, by Martin Gardener is another book that covers this subject. The Feynman Lectures Volume 1 contains Chapter 52, Symmetry in Physical Laws, that deals with what we mean by left and right, and how we might go about instructing a Martian on these concepts. As Feynman concluded, we might have some success in instructing a Martian (who is probably made of matter and not anti-matter), but we would have no way at all to instruct a more remote alien about what left-right is.